Unit 1: Cardiopulmonary Resuscitation and Automated External Defibrillation Skills. The QA Level 2 Award in Cardiopulmonary Resuscitation and Automated External Defibrillation (RQF) is an accredited, regulated and quality assured qualification that is recognised throughout the UK. This intensive 1-day course qualifies individuals to practice effective CPR and use an AED when dealing with an emergency situation. The CPR and AED course that we deliver has a Total Qualification Time (TQT) requirement of 6 hours. The maximum period to achieve this qualification (including any referrals) is 3 weeks. Principles of BLS / BLS techniques / AED use / Post-resuscitation procedures / AED maintenance. 1 x Theory assessment (Multiple Choice Question Paper). Upon successful completion of this course individuals will receive a printed QA Level 2 Award in Cardiopulmonary Resuscitation and Automated External Defibrillation (RQF) certificate as well as a plastic aide memoire. This qualification is valid for 1 year from date of certification. A maximum of 12 students can be accommodated on this course. Please note that students must be at least 16 years old on the first day of training. 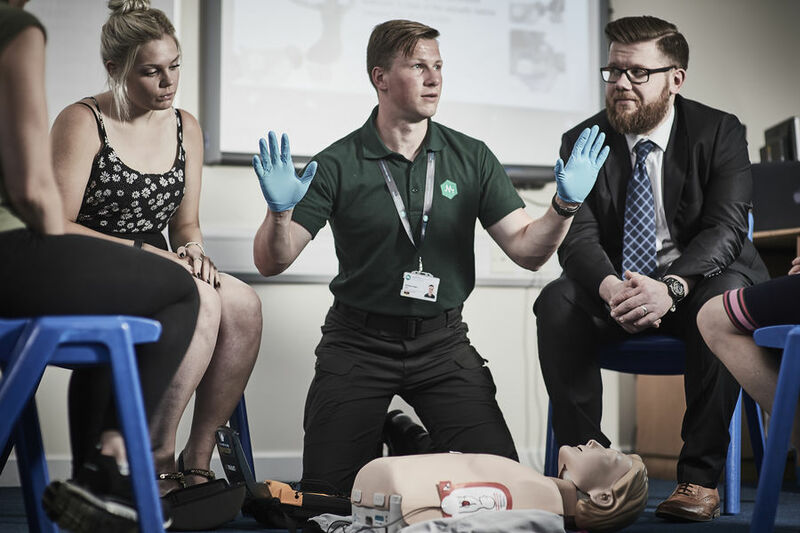 We are able to deliver our CPR and AED course on your premises (subject to a pre-course assessment) to reduce the costs associated with taking time out and travelling. 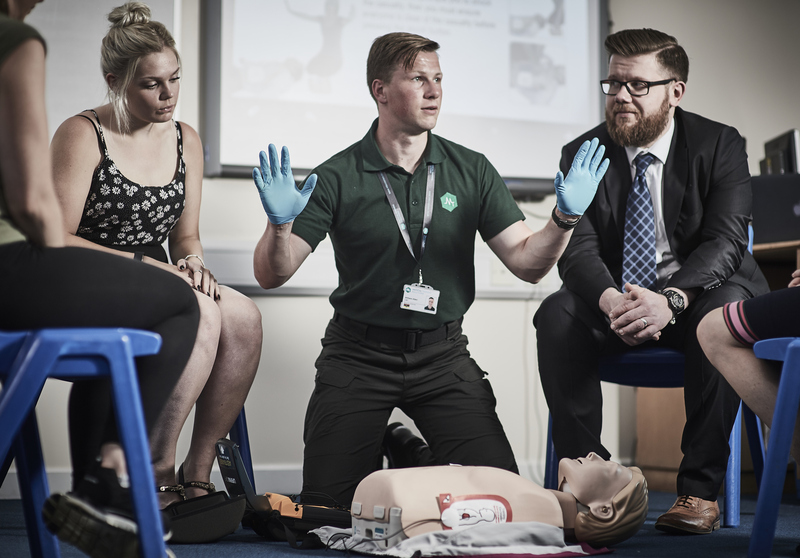 If you would like more information or to book your CPR and AED training course with us, please complete an enquiries form or call our team on 01603 486448. As of 2019, Medical Training Solutions will be offering a wide variety of mental health first aid training courses that are accredited, regulated, quality assured and delivered by actively practicing Mental Health Nurses with a wealth of real-life experience in dealing with mental health. What is First Aid for Mental Health? / Identifying mental health conditions / Providing advice and starting a conversation / Stress / Mental health conditions / Drugs and alcohol / First Aid for Mental Health action plan / First Aid for Mental Health in the workplace / Depression / Post-traumatic stress disorder / Self-harm / Suicide / Eating disorders / Personality disorders / Bipolar disorder / Psychosis / Schizophrenia / Anxiety. We are able to deliver our Mental Health First Aid training course on your premises (subject to a pre-course assessment) to reduce the costs associated with taking time out and travelling. Unit 1: Emergency First Aid in the Workplace. Unit 2: Recognition and Management of Illness and Injury in the Workplace. The QA Level 3 Award in First Aid at Work (RQF) is an accredited, regulated and quality assured qualification that is recognised throughout the UK. This comprehensive 3-day course qualifies participants to the highest level of first aid, enabling them to administer effective treatment to a wide range of acute injuries and chronic illnesses. The First Aid at Work course we deliver has a Total Qualification Time (TQT) requirement of 22 hours. In order to facilitate continual learning, the course should be delivered over 3 consecutive days; however, this can be adapted to suit your individual requirements. The maximum period to achieve this qualification (including any referrals) is 10 weeks. Roles & Responsibilities / Incident Assessment / Unresponsive casualties / Resuscitation and AED / Choking / External bleeding / Shock / Minor injuries / Secondary survey / Bones, joints and muscle injures / Head and spinal injuries / Chest injuries / Burns & Scalds / Eye injuries / Poisoning / Anaphylaxis / Major illnesses (Heart attack / Stroke / Epilepsy and seizures / Asthma / Diabetes). 2 x Theory assessments (Multiple Choice Question Papers). Upon successful completion of this course, individuals will receive a printed QA Level 3 Award in First Aid at Work (RQF) certificate as well as a plastic aide memoire. This qualification is valid for 3 years from date of certification. A maximum of 12 students can be accommodated on this course. Please note that students must be at least 14 years old on the first day of training. We are able to deliver our First Aid at Work training course on your premises (subject to a pre-course assessment) to reduce the costs associated with taking time out and travelling. If you would like more information or to book your First Aid at Work training course with us, please complete an enquiries form or call our team on 01603 486448. The QA Level 3 Award in First Aid at Work (RQF) is an accredited, regulated and quality assured qualification that is recognised throughout the UK. This shortened 2-day re-qualification course qualifies participants to the highest level of first aid, enabling them to administer effective treatment to a wide range of acute injuries and chronic illnesses. FAW re-qualification courses are only 12 hours in duration compared to 18 hours for the initial course. This means that the syllabus is covered at a significantly faster pace in the understanding that learners are familiar with the topics. Health and Safety Executive (HSE) guidance is clear that if an employee's FAW certificate expires, they are "no longer considered competent to act as a first aider in the workplace". For this reason, you should make every effort to re-qualify a first aider before their certificate expires. Employers and students should be aware that there is an increased risk of failing to achieve the required standard if previous certification has expired by a considerable period (HSE defines this as in excess of 1 month). If this is the case, the HSE recommend "it may be prudent to complete a 3 day course". This course has a Total Qualification Time (TQT) requirement of 16 hours. In order to facilitate continual learning, the course should be delivered over 2 consecutive days; however, this can be adapted to suit your individual requirements. The maximum period to achieve this qualification (including any referrals) is 10 weeks. Upon successful completion of this course individuals will receive a printed QA Level 3 Award in First Aid at Work (RQF) certificate as well as a plastic aide memoire. This qualification is valid for 3 years from date of certification. We are able to deliver our First Aid at Work (Re-qualification) course on your premises (subject to a pre-course assessment) to reduce the costs associated with taking time out and travelling. If you would like more information or to book your First Aid at Work (re-qualification) course with us, please complete an enquiries form or call our team on 01603 486448. The QA Level 3 Award in Emergency First Aid at Work (RQF) is an accredited, regulated and quality assured qualification that is recognised throughout the UK. This intensive 1-day course qualifies students to practice safe, prompt and effective first aid in a wide range of emergency situations. The Emergency First Aid at Work course that we deliver has a Total Qualification Time (TQT) requirement of 7 hours. The maximum period to achieve this qualification (including any referrals) is 3 weeks. Roles & Responsibilities / Incident Assessment / Unresponsive casualties / Resuscitation and AED / Choking / External bleeding / Shock / Minor injuries. Upon successful completion of this course individuals will receive a printed QA Level 3 Award in Emergency First Aid at Work (RQF) certificate as well as a plastic aide memoire. This qualification is valid for 1 year from date of certification. We are able to deliver our Emergency First Aid at Work course on your premises (subject to a pre-course assessment) to reduce the costs associated with taking time out and travelling. If you would like more information or to book your Emergency First Aid at Work training course with us, please complete an enquiries form or call our team on 01603 486448. The QA Level 3 Award in First Aid at Work (Annual Refresher) (RQF) is an accredited, regulated and quality assured qualification that is recognised throughout the UK. The Health and Safety Executive (HSE) strongly recommend that qualified First Aiders undertake annual refresher training in order to remain proficient in their role. This intensive 1/2-day course provides individuals with an opportunity to practice essential first aid skills and reestablish their confidence. The First Aid at Work (Annual Refresher) course that we deliver has a Total Qualification Time (TQT) requirement of 4 hours. The maximum period to achieve this qualification (including any referrals) is 3 weeks. Incident Assessment / Unresponsive casualties / Resuscitation and AED / Choking. Upon successful completion of this course, individuals will receive a printed QA Level 3 Award in First Aid at Work (Annual Refresher) (RQF) certificate as well as a plastic aide memoire. This qualification is valid for 1 year from date of certification. We are able to deliver our First Aid at Work (Annual Refresher) course on your premises (subject to a pre-course assessment) to reduce the costs associated with taking time out and travelling. If you would like more information or to book your First Aid at Work (Annual Refresher) training course with us, please complete an enquiries form or call our team on 01603 486448. Unit 1: Emergency Paediatric First Aid. Unit 2: Managing Paediatric Illness, Injuries and Emergencies. The QA Level 3 Award in First Aid at Work (RQF) and the QA Level 3 Award in Paediatric First Aid (RQF) are accredited, regulated and quality assured qualifications that are recognised throughout the UK. This combined 3-day course qualifies individuals to practice effective first aid for adults, children and infants. The Combined First Aid at Work and Paediatric First Aid course has been specifically designed for those who work in settings that require both first aiders and paediatric first aiders such as: schools, sports clubs and other settings where adults and children are both present. The First Aid at Work and Paediatric First Aid course we deliver has a Total Qualification Time (TQT) requirement of 22 hours. In order to facilitate continual learning the course should be delivered over 3 consecutive days; however, this can be adapted to suit your individual requirements. The maximum period to achieve this qualification (including any referrals) is 10 weeks. Roles & Responsibilities / Incident Assessment / Unresponsive casualties / Resuscitation and AED / Choking / External bleeding / Shock / Minor injuries / Fractures / Head, neck and back injuries / Eye, ear and nose injuries / Diabetes / Asthma / Allergies / Meningitis / Febrile convulsions / Extreme heat and cold / Electric shocks / Burns & Scalds / Poisoning / Anaphylaxis. Upon successful completion of this course individuals will receive a printed QA Level 3 Award in First Aid at Work (RQF) AND a printed QA Level 3 Award in Paediatric First Aid (RQF) certificate as well as plastic aide memoirs. These qualifications are valid for 3 years from date of certification. We are able to deliver our First Aid at Work and Paediatric First Aid course on your premises (subject to a pre-course assessment) to reduce the costs associated with taking time out and travelling. If you would like more information or to book your First Aid at Work and Paediatric First Aid training course with us, please complete an enquiries form or call our team on 01603 486448. The QA Level 3 Award in Paediatric First Aid (RQF) is an accredited, regulated and quality assured qualification that is recognised throughout the UK. This comprehensive 2-day course qualifies individuals to administer effective first aid to a wide range of paediatric injuries and illnesses. Those who have gained a level 2 and/or level 3 childcare qualification and have entered into an early years setting and wish to be included in the staff-to-child ratios to comply with EYFS requirements. Anyone who has a non-professional involvement with infants and children, such as parents and grandparents, and wants to learn key paediatric first aid skills. The Paediatric First Aid course that we deliver has a Total Qualification Time (TQT) requirement of 16 hours. In order to facilitate continual learning the course should be delivered over 2 consecutive days; however, this can be adapted to suit your individual requirements. The maximum period to achieve this qualification (including any referrals) is 6 weeks. Upon successful completion of this course individuals will receive a printed QA Level 3 Award in Paediatric First Aid (RQF) certificate as well as a plastic aide memoire. This qualification is valid for 3 years from date of certification. We are able to deliver our Paediatric First Aid course on your premises (subject to a pre-course assessment) to reduce the costs associated with taking time out and travelling. If you would like more information or to book your Paediatric First Aid training course with us, please complete an enquiries form or call our team on 01603 486448. The QA Level 3 Award in Emergency Paediatric First Aid (RQF) is an accredited, regulated and quality assured qualification that is recognised throughout the UK. This intensive 1-day course qualifies individuals to practice safe, prompt and effective first aid in a wide range of paediatric emergencies. Those who have gained a Level 2 or 3 childcare qualification and have entered into an early years setting and wish to be included in the staff-to-child ratios to comply with the EYFS requirements. Anyone who cares for infants and children, such as parents, guardians and grandparents, or those who have an involvement with infants and children and want to learn key paediatric first aid skills. The Emergency Paediatric First Aid course that we deliver has a Total Qualification Time (TQT) requirement of 8 hours. The maximum period to achieve this qualification (including any referrals) is 4 weeks. Upon successful completion of this course individuals will receive a printed QA Level 3 Award in Emergency Paediatric First Aid (RQF) certificate as well as a plastic aide memoire. This qualification is valid for 3 years from date of certification. We are able to deliver our Emergency Paediatric First Aid course on your premises (subject to a pre-course assessment) to reduce the costs associated with taking time out and travelling. If you would like more information or to book your Emergency Paediatric First Aid training course with us, please complete an enquiries form or call our team on 01603 486448.